The Renault Wind is a short-lived addition to Renault’s collection, yet it has made a considerable impression on some motorists. It is very unique in styling and is a small, roadster style vehicle designed to be nippy and full of character. Plus, it can be picked up for a great price on the used car market. 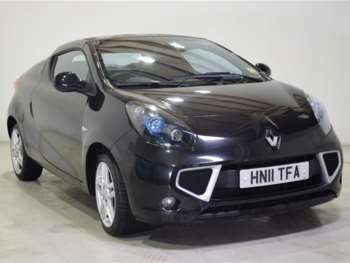 The range of used Renault Winds for sale at RAC Cars features a host of clever design features. Space has always been at a premium in this small convertible and smaller cabin sizes mean that passenger space is limited and driving position can be compromised. The roof mechanism has been streamlined and when combined with the shorter cabin space, the new simpler mechanism means that there is more luggage space on offer. The Renault Wind offers the motorist all the benefits of a small convertible but with a luggage capacity nearing 300 litres. Used Renault Winds come in two engine sizes; a 1.2 and a 1.6 litre. At the lower end of the range, the 1.2 litre turbo engine is borrowed from the nippy Twingo range, operates at 100bhp and delivers 135Nm of torque once you get over 3000rpm. The 1.6 extends this power to 133bhp. In a small framed car, the 1.6 engine excels and offers a satisfying growl with the convertible roof dropped, thanks to the custom fitted exhaust system. This is a fun car to drive thanks to the lightweight and relative power of the engine. Got a specific Renault Wind model in mind?